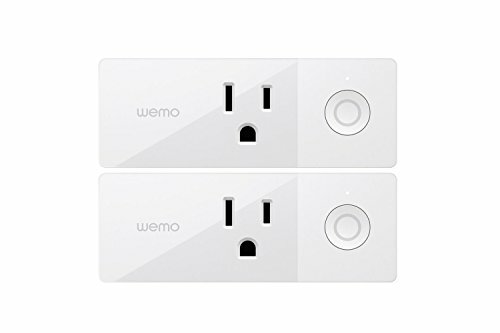 Wemo Mini Wi-Fi Smart Plug allows you to control electronic devices from your phone. Simply download the free app, plug in and connect and control your lights and appliances from the office, store or while on vacation. The smart plug uses your existing home network to wirelessly control appliances such as fans, lamps, heaters and more. The Wemo mini also lets you schedule on and off times for any device that is plugged in. Using the app, synchronize your lights with the sunset so you do not come home to a dark house or schedule a fan to turn on at 1:00pm. The Wemo features an "away mode" that when turned on randomly turns off and on plugged-in lights to make it appear as though you are home when you are not. Compatible with Amazon Alexa and google home, turn your appliances, lights or a room off or on with your voice. It also works with Nest's thermostat. Nest's away and home modes can sync with the Wemo for automatic control. Nest can tell Wemo when your are home or not home, so your fan can turn off when the house is empty or the lights can turn on automatically when you walk in the house. The Wemo will give you a piece of mind, you will never have to worry about accidentally leaving anything on again.